This salad is the one to make when you have a perfectly fresh bunch of beets with vibrant greens still attached. You can leave it simply dressed with a bit of olive oil and salt, or add lemon zest, chopped hazelnuts, or feta or goat cheese if you want to dress it up a bit for company. Some people may even enjoy a sprinkle of balsamic vinegar or agrodolce. However, ​if you dress it up, be sure to serve it with some crusty bread or something else to sop up the delicious juices that will be left on the bottom of the plate once you've eaten the beets. Cut off the greens from the beets, and then trim the beets. Very young and tender beets can be scrubbed clean, but you will want to peel most beets. 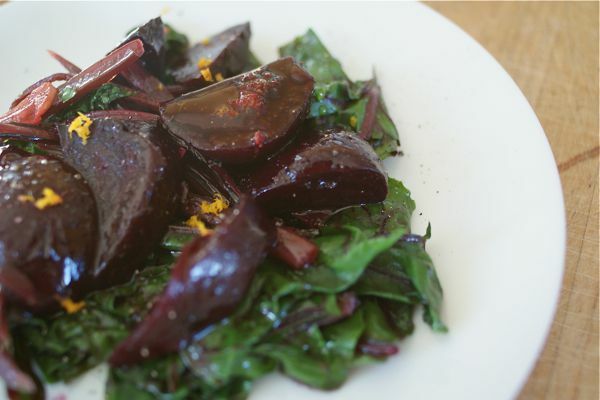 Cut the beets in half lengthwise, lay them cut-side flat and cut them into 1/4-inch-thick slices. Heat a large frying pan over medium heat. Add 1 teaspoon of the olive oil, 1/4 cup of water, and the beets. Cover and cook until the beets are just barely tender, 5 to 10 minutes. While the beets start to cook, rinse the beet leaves and cut out their thick stems (cut a "v" into the leaf to remove the thick stem while saving most of the tender leaf around it. Trim the stems and cut them into about 2-inch lengths. When the beets are just starting to seem tender, add the stems to the pan. Cover and let cook until the beets and beet stems are tender, about 3 minutes. Meanwhile, chop the leaves and set them aside. Peel and thinly slice the garlic. Add the garlic to the pan, cook, stirring, until fragrant, about 1 minute. Add the chopped beet greens, cover, and cook until the leaves are wilted about 1 minute. Divide the warm salad between 4 plates. Spoon any pan liquids evenly over each serving. Drizzle each salad with the remaining olive oil and sprinkle with salt. Add any optional garnishes (lemon zest, orange zest, hazelnuts, feta, goat cheese) that you like.